Resistance training, weight training and strength training are terms used to describe a form of exercise that involves the use of weights. 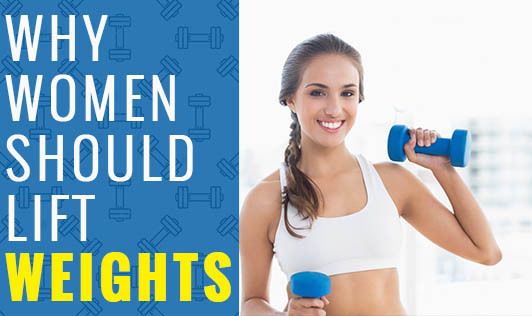 Most women are skeptical about weight training and are petrified about "bulking up" like men. This is a very common misconception most women have. To begin with, a man's body composition and hormones function differently. Men have a higher amount of testosterone that is responsible for their masculine body and muscle mass. This difference doesn't allow a woman to become muscular like a man's body, unless they are on certain steroids that help them achieve that body type. Our bodies are primarily made of muscle, fat, water and bones. There is a certain amount of fat required in our body to maintain normal life processes. However, most Indian women have a high fat percentage that predisposes them to many diseases. Though cardio training helps to burn calories, a certain amount of strength training is essential for several benefits that many women are not aware of. Bones: With resistance training, a woman can develop stronger bones and joints by aiding in mineral deposition. This helps her withstand more stress, prevent osteoporosis and slow down bone deterioration. Metabolism: You want to raise your metabolism? Then, lift some weights! With weight training, one begins to develop more muscle. Muscles have a higher metabolic rate than fat mass and so help you burn fat faster. The more muscle mass you have, the higher is your metabolic rate. This means that you will burn what you eat more efficiently. Healthier Old Age: With weight training, you will be protecting yourself from age-related disorders. It increases flexibility of muscles and reduces chances of back aches. Fitness: If you want a fit, toned body, weight training is necessary. The more you work the different muscles of your body, the more toned your body will begin to look. Prevent Diseases: Studies have shown that a high muscle mass percentage is linked to a lower risk of heart diseases, diabetes, hypertension and obesity. Weight Loss: Your muscles are calorie-burning cells. The more muscle mass you have, the more calories you will start burning even when you are at rest. Do cardio exercises burn more calories? Yes, if you are looking to lose weight, cardio exercises may be the best option for you. But, you may lose out on several other health benefits. Also, with weight training, it is possible for you to lose the same number of calories depending on the weights, the repetitions and the frequency of training. At the same time, you will get a whole lot of other benefits too. Some women on weight training may complain of the weigh scale showing the same weight in spite of the efforts in the gym. This does not mean your work out isn't paying off. It's just that muscle weighs more than fat and so, the scales may not show the difference, but you are undoubtedly creating more health benefits for yourself.